As we've already heard tonight, Sony expect to make less money from their games division, thanks to lower than predicted sales. But just where are sales lower than expected? Let's take a look. As you can see on the right, although software sales for the financial year will be down, Sony had already predicted lower sales before the economic crisis really hit its straps. So they're not to blame. Hardware sales are. Before things went sour for the electronics giant, projections had the company selling 10 million PS3's, 16 million PSP's and 9 million PS2's this financial year. Now that things have gone sour, however, those numbers have been revised downwards. While they're still on track to sell 10 million PS3's for the financial year, PSP sales forecasts have been trimmed to 15 million, while PS2 projections have been cut back to 8 million. Not catastrophic by any stretch of the imagination, especially since both consoles are (relatively) a little long in the tooth (and the PS3 isn't going down), but still. 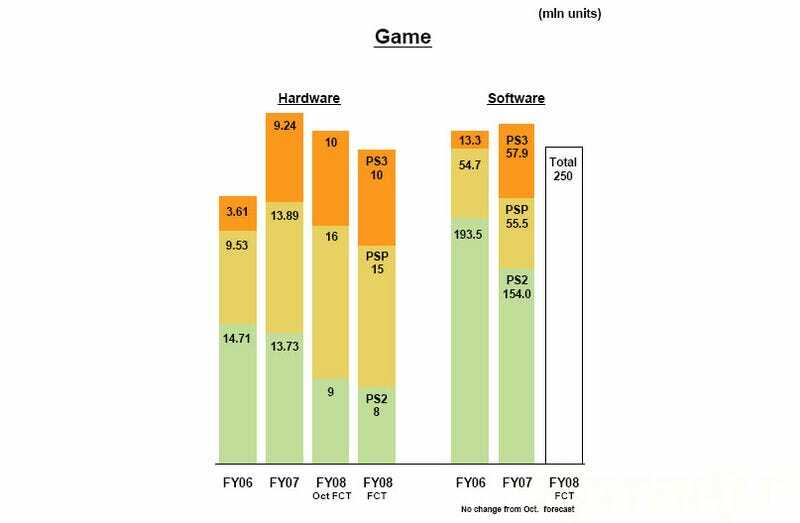 Slight increases in PSP and PS3 sales over the 2007 financial year aren't making up for the slide in PS2 sales, as the chart above shows.